Broadmeadows, a rural settlement to the west of Melbourne, was the site of the main camp for the reception and training of recruits for the AIF from Victoria early in the First World War. Broadmeadows had been identified as a possible site for military training in 1913, but no facilities had been established. It was close to a railway line, was flat with plenty of room for a large number of soldiers and could be well watered. The camp was established in August 1914 at Mornington Park, a property loaned to the government by Mr R.G. Wilson. 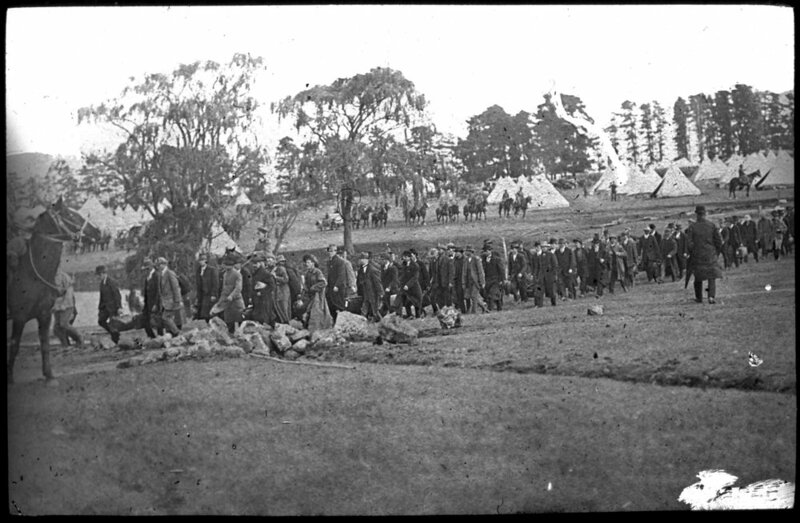 On 19 August 1914, two weeks and one day after the announcement of war, 2,500 men set off for Broadmeadows from central Melbourne. Crowds lined the streets as these men in civilian clothes walked from Victoria Barracks to the camp. Early on, Broadmeadows was predominantly a tented camp and conditions were quite spartan. These facilities, combined with wet weather and poor drainage resulted in a rapid increase in sickness among recruits in autumn 1915. Public concern, fuelled by sensationalist press coverage, resulted in a decision in May 1915 to re-establish the main Victorian training camp at Seymour approximately 100 kilometres north of Melbourne. Broadmeadows Camp remained in use throughout the war, however, with facilities being progressively improved.